When it's garlic scape season at the farmers market we can't resist taking home a big bag. 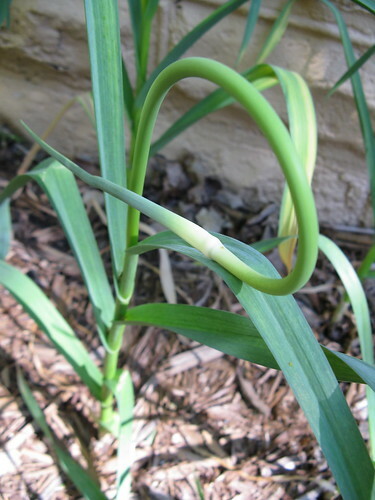 A garlic scape is the flower stem of the garlic plant. It is removed so the garlic plant will put its energy into growing a bigger bulb instead of a flower. Those stems have a wonderful fresh garlic flavor. I find they tend to be a little milder than your average garlic clove. You can chop them up and use them to replace garlic in recipes, but we like to turn them into Garlic Scape Pesto that we can freeze to use all year. Matt thought the mild garlic flavor would be great with the spring peas we picked up last week. And even better in a mac and cheese. This was a fabulous spring mac and cheese. The flavors are so balanced between the spicy scapes, sweet peas and salty cheese. The peas are puréed, so when they and the pesto are added to the cheese sauce everything turns a lovely shade of light green. 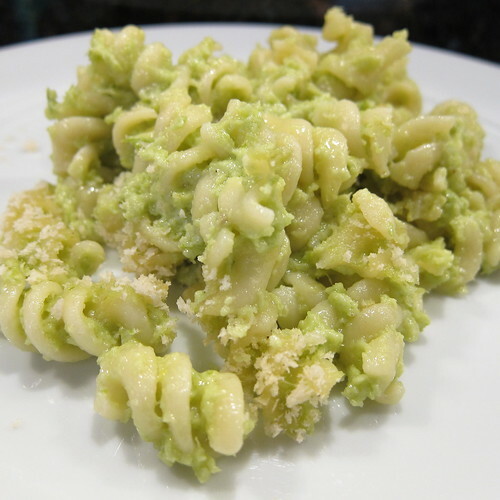 Fusilli is a great shape pasta for this dish because it holds lots of the sauce in its corkscrews. In a large saucepan, melt the butter over medium heat. Add the flour and cook while stirring for 1 minute, do not let it brown. Slowly whisk in the half and half to create a thick white sauce. Stir in the cheese until melted. Add the pesto and pea purée and stir to combine. Taste and add salt and pepper as needed. Mix the pasta and sauce together until the pasta is completely covered. 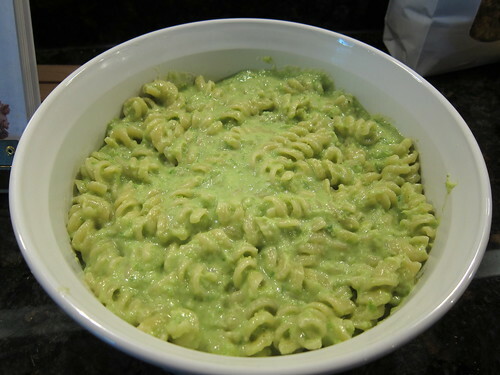 Pour into a large casserole. Sprinkle some panko on top. Bake for 30 minutes until the top is crispy. nice cheese selection and really inventive use for your pea pods! The mac n cheese is such a great idea! I got garlic scapes from a friend for the first time this year. 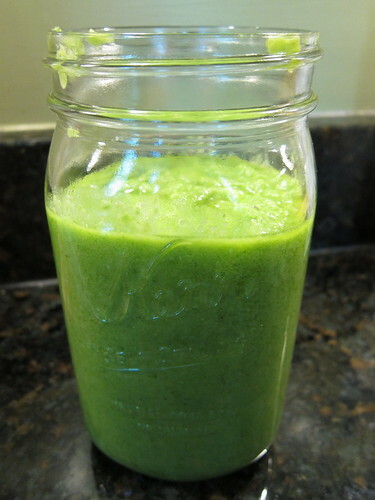 Now I have all the pesto to use up (which isn't a bad thing). Love this idea!